While at ETS, I was keenly reminded that biblical creationism is a foundational issue for developing a biblical worldview. How can one claim to hold to a literal Fall of Adam and curse on the created world order (Rom 5, 8), yet argue that there were millions of years of pain, suffering and death before the Fall? The truth is that this type of interpretation cannot be consistently defended with the Bible. Any denial of and apathy towards this subject among evangelicals is distressing and will minimize a consistent Christian witness. In keeping with the importance of biblical creationism and its relevance for developing an exegetical and theological Christian theodicy, let me encourage you to take some time to read Dr. Mortenson’s important critique of Dembski’s theodicy. The problem of evil is always a challenge for the Christian witness. Human suffering and moral evil are relatively easy for the apologist to explain, and the Fall of Adam is a key to that explanation. But the thornier question is that of natural evil (disasters like hurricanes, volcanoes, earthquakes) that kill not only people but innocent animals. In particular, if we accept millions of years of animal death, disease, and extinction before Adam was even created, how do we explain that in light of God’s attributes and purposes? William Dembski has published a 54-page response to this question. He explains his reasons for rejecting the young-earth creationist theodicy and several old-earth theodicies and proposes a solution that accommodates the millions of years of natural evil which evolutionary scientists insist occurred before man appeared. This paper will analyze and critique Dembski’s proposal, showing it to be inadequate and inconsistent with Scripture and contending that only the young-earth view gives an adequate and biblically sound answer to the problem of natural evil. It is there a powerful apologetic ot make the Christian witness effective in our evolutionized world. To read a PDF of the full article, go here. This blog entry continues to develop our third guideline for interpreting Proverbs. With part six, we looked at the first five of ten forms found in this book. With this post, we will complete the third principle: identifying precise literary forms. This form is a variation of comparative sayings. This saying is designed to set forth priorities and values. Some have concluded that this type of proverb is a form of relativism advocated by the sages of Israel. Against this, it is more precise to view this as eliminating one element and affirming another (Hildebrandt, “Proverbs,” p. 242). “Better is a poor man who walks in his integrity than a rich man who is crooked in his ways” (Prov 28:6). To be rich and crooked is not a lifestyle to be valued, but there is value in being poor with integrity. An example story recounts an illustration or personal experience and how from experience he has learned a truth worth leaving to others. This form has three basic parts: an opening where the sage notes his experience, a story illustrating his point, and the moral conclusion. Proverbs 24:30–34 is an example of this (also see 7:6–23). The opening is in v. 30, the example story in vv. 31–32, and the moral conclusion in vv. 33–34 (Klein, Blomberg, and Hubbard, Introduction to Biblical Interpretation, p. 317). A beautitude is a pronouncement of blessing on someone by an authority figure. When this is used in wisdom literature, it provides a motivation to convince someone that blessing comes by following the advised course of action (see 3:13–14; 8:32, 34; 16:20; 20:7; 28:14; 29:18). Proverbs 20:7 reads like this: “The righteous who walks in his integrity—blessed are his children after him!” Because a man has a life of integrity, his children will be the beneficiaries from his integrity. An acrostic poem uses the Hebrew alphabet as a device for structuring. An acrostic poem is used in Proverbs 31:10–31 to describe the virtuous women. The acrostic poem connotes completeness by emphasizing that this woman’s qualities go from A through Z, from beginning to end, she is a most excellent woman. The point is that her virtuous character has been thoroughly presented. With this post and the previous one, we have looked at the third principle for interpreting the book of Proverbs: identifying precise literary forms. In our next two posts, I will continue my series of posts by examining the fourth principle for understanding Proverbs. With part 5 of Interpreting Proverbs, we looked at the seven collections of proverbs that make up the book of Proverbs. With this and the next post, we will look at the third principle for reading this book. This third guideline places proverbial literature into more precise literary forms. I am using the term “form” as a descriptive category denoting the manner in which wisdom material is presented (Garrett, Proverbs, p. 28). There are two predominant literary forms, instruction and saying, and eight secondary forms. We will briefly examine each of these. The instruction form is the dominant form found in Proverbs 1–9 and 22:17–24:22. It is a longer form of the admonition (a command or prohibition), usually involving one or more paragraphs explaining a number of related admonitions. The instruction is directed to “my son” or “sons” (which may include the concept of “disciple”) and generally provides a reason for the instruction. It generally praises wisdom and its attributes or provides a warning about the traps of folly and its disciples. The primary point of the instruction is to give advice on wisdom or a related subject or to provide a warning against folly or a related subject (Hubbard, Proverbs, p. 18). This is an abbreviated form of the longer instruction form, usually comprised of one to three verses. It expresses either a positive command or a prohibition followed by a motive clause. The motive clause provides a reason why the command should be followed. When we interpret the admonition, we should note the connection between the command and the motive clause. This connection is helpful in understanding the point of the admonition (Hildebrandt, “Proverbs,” in Cracking Old Testament Codes, p. 241). A command followed by a motive clause is found in Proverbs 4:23, “Watch over your heart with all diligence, for from it flow the springs of life.” The importance of this command is seen by the motive clause, viz., what is manifest in one’s life is an overflow from the contents of his heart. This is a subcategory of the instruction. In this type, wisdom as well as folly, wisdom’s antithetical form, is personified as a woman publicly proclaiming a message. For example, the lady wisdom cries out to deliver its recipients in Proverbs 1:20–33; 8:1–36; 9:1–6. The counterpart to the wisdom speech is folly. The lady folly calls aloud to mislead in 9:13–18 (Hubbard, Proverbs, p. 18). The saying is the dominant form used in Proverbs 10:1–22:16 and 25:1–29:27. A saying is essentially a sentence involving two parallel lines. While the mood of the instruction form is imperatival, the mood of the saying is indicative. As filtered through special revelation, the force of a saying is found in the wisdom or folly displayed in human experience (ibid.). The comparative saying is a subcategory of the saying. It generally uses a simile or metaphor to intensify the main point of the saying. An example of this is Proverbs 26:8, “Like one who binds a stone in a sling, so is he who gives honor to a fool.” In interpreting this type of saying, we must note the images being used, the main point of the proverb, and the connection between them. The image in the first clause is that of securely fastening a stone in the sling. The main point of the saying is in the last clause, “so is he who gives honor to a fool.” The point of this saying is that honoring a fool is as foolish as making it impossible for a stone to get out of the sling. At other times, the lines may simply be in juxtaposition. “A whip is for the horse, a bridle for the donkey, and a rod for the back of fools” (Prov 26:3). The images in the first two clauses are the horse and donkey. The main point is in the last clause, “a rod for the back of fools.” The point of this saying is that the fool, being as difficult to control as the horse and the donkey, must be controlled by strong force. In looking at the third principle for interpreting proverbs, we have examined the first five of ten literary forms used in the book of Proverbs. With the next post, we will look at the remaining five literary categories. On July 10 I did a post about a biblical creation seminar DBTS offered in this past spring semester. With this entry, I mentioned that the Detroit Baptist Seminary Journal would have a review of Coming to Grips with Genesis in its 2009 edition (to subscribe to the journal, go here). Last month volume 14 of the journal was released and in it Dr. Matt Postiff has a rigorous, yet positive review of this book (to get a great discount with purchasing the book, to the DBTS Store). I highly recommend that you read Dr. Postiff’s review. He is the pastor of Fellowship Bible Church in Ann Arbor, MI. He has received a Bachelor’s, Master’s, and Ph.D. in computer engineering from the University of Michigan. After earning his Ph.D., he earned a Master of Divinity from Detroit Baptist Theological Seminary in 2005 and is currently writing his Master of Theology thesis on Middle Knowledge: “How God Knows Counterfactuals.” Lord willing, he should be awarded the Master of Theology degree in May of 2010 (to read more about Dr. Postiff, go to his church’s website). 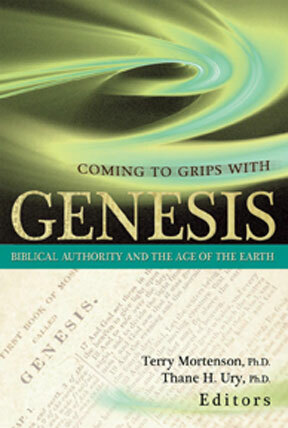 Though Matt makes some recommendations to improve a second edition of Coming to Grips with Genesis, he highly recommends purchasing and using the book with these words: “The book is a scholarly, biblical, and comprehensive defense of the young-earth view. The authors easily achieved their immediate goal–to present the key arguments for the young-earth view. They also successfully raised the issue that the age of the creation has a serious impact on foundational truths of the Christian faith. Issues such as the sufficiency, authority, and clarity of Scripture and consistency in hermeneutics are indeed at stake. The authors wisely avoid the error of making the young-earth view a fundamental of the faith. A major strength of the book is that it is a compilation of works by authors whose expertise is particularly focused on the topics on which they write.” To read his full review, go here. Does It Take Millions of Years to Form Rocks?